The cell. 7. Microtubules. Atlas of plant and animal histology. 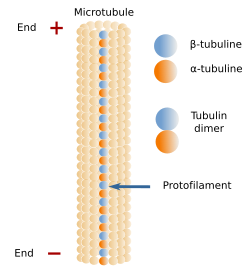 Microtubules are a component of the cytoskeleton, made up of many dimers of α- and β- tubulin proteins. Microtubules are polarized filaments where polymerization and depolymerization of the microtubule alternatively occur, process known as dynamic instability. Microtubules are mainly nucleated by protein complexes known as γ-tubulin rings. In the animal cells, γ-tubulin rings are located in the pericentriolar material of the centrosome. 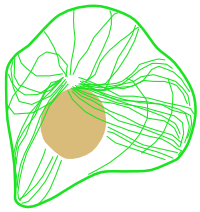 In plant, they can be found at different locations of the cell. Microtubules are involved in a number of cellular functions such as intracellular organization of the cytoplasm and the cell division. These jobs are done with the help of motor proteins: dyneins and kinesins. Cilia and flagella have microtubules for structural support and movement (helped by motor proteins). Microtubules are a component of the cytoskeleton involved in the organization of the eukaryotic cell cytoplasm. They carry out many functions, such as the spatial organization of organelles, work as tracks for vesicular trafficking, are needed for cell division since they form the mitotic spindle, help with the cell movement, and are the skeleton of cilia and flagella. Organization of microtubules in an animal cell in culture. Microtubules are long and relatively stiff tubules. Their wall is made up of many dimers of globular proteins: α- and β-tubulin, which are lined up in long rows known as protofilaments. Within a protofilament, there is no chemical bonds between adjoining tubulin dimers. A microtubule is usually composed of 13 protofilaments. α- and β-tubulin pairs are oriented in the same way, so that there is always α-tubulin in one end of the protofilament and β-tubulin in the other. Thus, microtubules are polarized structures. The end formed by α-tubulin is known as minus end, and that formed by β-tubulin is known as plus end. Microtubules are dynamic structures, which means that there is a continuous gain and lost of tubulin dimers, i.e. polymerization and depolymerization, respectively. New tubulin dimers are mainly added to the plus end, where the growth of the microtubule usually happens, although depolymerization also occurs. In the minus end, depolymerization prevails over polymerization. In this way, microtubules growth occurs at plus end, whereas shrinkage occurs at the minus end. That is why the minus end is usually protected against lost of tubulin dimers. However, plus end is very dynamic, and polymerization-depolymerization alternance commonly happens, sometimes so intense that the microtubule may disappear by a complete depolymerization. Transmission electron microscopy image showing microtubules inside a dendrite of a neuron. 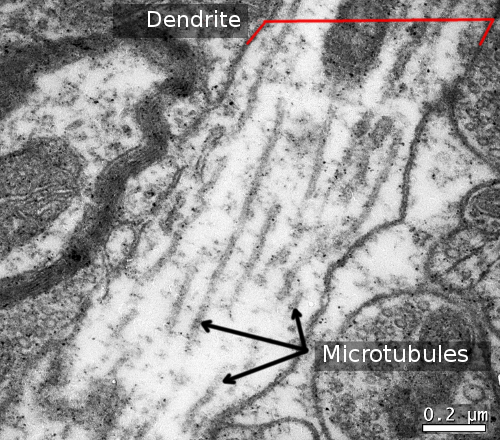 Microtubules are oriented parallel to the long axis of the dendrite. Organization of the tubulin dimers inside one protofilament. Note that α-tubulin is oriented to the minus end, whereas β-tubulin is the plus end. Microtubules undergo a continuous polymerization and depolymerization, mainly happening in the plus end. In fibroblasts, half of the available tubulin is free in the cytosol, and the other half are microtubules. This situation is quite different from that of the intermediate filaments, where most of the proteins are in the filaments. In microtubules, there is a continuous interchange of tubulin dimers between the microtubules and the cytosol, which becomes important when cell has to change the spatial arrangement of microtubules. Once a microtubule has been nucleated, the growing in length is by addition of new tubulin dimers to the plus end. The growth is stopped from time to time, and growth periods are alternated with shrinkage periods. The depolymerization is sometime so fast that the complete microtubule may disappear. But, it is most frequent the restarting of a new polymerization period. This alternance happens in most of the plus ends of cytosolic microtubules, and it is known as dynamic instability. How is the molecular process? In this image, GTP- and GDP-tubulin dimers are depicted. In the cytosol, GDP-tubulin dimers are transformed in GTP-tubulin dimers, whereas the opposite process occurs in the so-called hydrolysis zone of the microtubule wall. 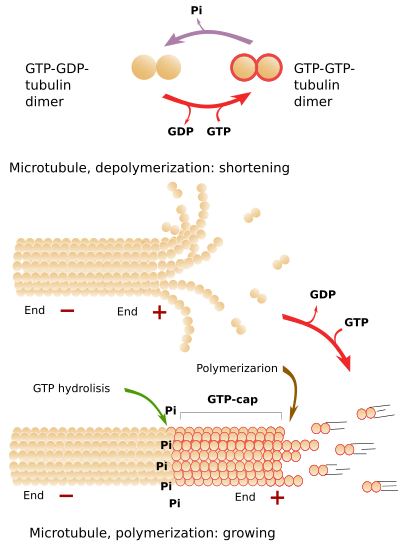 A microtubule shrinks when GDP-tubulin dimers are part of the plus end (there is no GTP cap), whereas it grows when GTP-tubulin dimers constitute the plus end (there is GTP cap). Free tubulin dimers have a GTP molecule linked to the β-tubulin. Sometime after the joining of tubulin dimer to the plus end of a microtubule, GTP is hydrolyzed to ADP and inorganic phosphate (Pi). However, the hydrolysis is not inmediate. If the rate of adding tubulin dimers to the plus end is faster than the hydrolysis rate, there will be always a group of tubulin dimers with GTP in the plus end, which is known as GTP-cap. GTP-cap stabilizes the plus end of the microtubule and boosts the polymerization. The addition, polymerization, of new tubulin dimers depends on many aspects and may be different in different parts of the cytosol, where the plus end may be located. If the addition rate is low, the hydrolysis rate may overcomes the polymerization speed. This means that there are ADP-tubulin dimers at the plus end, which form non so stable protofilaments. In this situation, depolymerization starts, and ADP-tubulin dimers are released to the cytosol. In the cytosol, ADP-tubulin dimers are quickly phosphorylated to GTP-tubulin dimers, which are ready to join to a microtubule plus end. If the polymerizaation rate increases, the GTP-cap will be formed again and elongation of the microtubule restarts. As occurs with other cytoskeleton filaments, there are microtubules associated proteins (MAPs). They regulate the polymerization and depolymerization, stability, as well as 3D organization of the cellular scaffold of microtubules. MAPs usually interact with the microtubule plus end, affecting the dynamic stability, either by boosting growth or depolymerization. For example, XMAP215 and EB proteins favour the polymerization by stabilizing tubulin dimers in the microtubule plus end. Katanin develops a more drastic action because it breaks the microtubules down into pieces, which are quickly depolymerized or may function as seeds for new microtubules. MAPs also allow microtubules to interact with other cellular elements such as organelles or cytosolic molecules. Some substances that affect the polymerization or depolymerization of microtubules have been used as medicine drugs. For example, colchicine inhibit microtubule growth, whereas taxol strongly attach to microtubules avoiding depolymerization. The concentration of cytosolic tubulin dimers is not high enough to spontaneously polymerizes and form new microtubules. In the cell, there are structures known as microtubule organizing centers (MTOCs) where microtubule are nucleated. The minus end of the new microtubules are anchored at MTOCs, whereas the plus end grows microtubules through the cytosol. Rings of γ-tubulin, located at the MOTCs, are molecular complexes where new microbules nucleate. Other proteins, such as TPX2 and XMAP125 also contribute to form new microtubules, either alone or cooperating with γ-tubulin rings. Centrosome is the major MTOC in animal cells. It is the main responsible for the number, localization and spatial organization of microtubules in the cytoplasm. In most of the animal cells, during G1 and G0 phases of the cell cycle, there is one centrosome per cell located close to the nucleus. Although one centrosome is commonly found in most of the animal cells, there are others like megakaryocytes containing multiple centrosomes, whereas muscle fibers lack centrosomes, and neurons show non radial microtubule organization. Centrosome is made up of two components: a couple of orthogonally oriented centrioles and a surrounding pericentriolar material, which is mostly proteins. Every centriole is a cylindrical structure with a wall made up of 9 triplets of microtubules. A typical centriole is 0,5 µm in length and 0,2 µm in diameter. In animal cells, centrosome is the main responsible for the microtubule scaffold organization. Centrosome contains a couple of orthogonally arranged centrioles surrounded by the pericentriolar material. γ-tubulin rings, which nucleate microtubules, are located in the pericentriolar material. There are many γ-tubulin molecules in the pericentriolar material organized as rings, known as γ-tubulin rings. 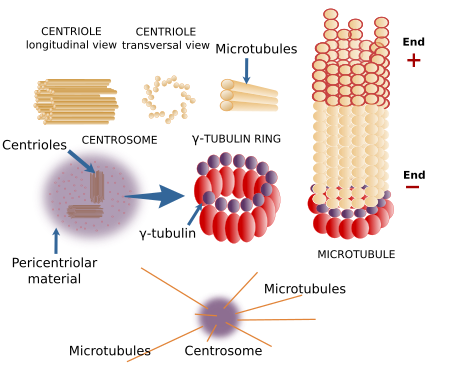 Centrioles, however, do not participate in the formation of microtubules nor in the spatial orientation, except the distal and subdistal appendages, which are structures attached to centrioles that can nucleate microtubules. The function of centrioles is still a mystery. For example, plant cells lack centrioles, and they can segregate chromosomes and divide in two new cells, and organize their microtubules without any problem. Centrioles are similar to basal bodies, structures located in the basal part of cilia and flagella. Basal bodies are capable of nucleating microtubules to form the skeleton of cilia and flagella. In lab conditions, spontaneous polymerization of microtubules can be done when γ-tubulin is present, and the concentration of α- and β-tubulin dimers is high enough. But such conentrations are hardly found in the cytosol. Centrosome, besides being a microtubule nucleator, is also important during the cell cycle because it contains many proteins involved in the progress of the cell cycle and in the organization of the mitotic spindle. For example, duplication of centrosomes before mitosis is essential to produce two "healthy" new cells. In this way, centrosome has been proposed as the cause of different types of cancer since many tumor cells have supernumerary centrosomes that may produce multipolar mitotic spindles and unequal distribution of chromosomes (aneuploidy). There are other cellular places where microtubules can be nucleated. For example, chromosomes during mitosis, cisterns of Golgi apparatus, basal bodies of cilia and flagella, and some new nucleation points sometimes depend on other microtubule. Blepharoplasts (also MTOCs) are molecular complexes of plant cells, occasionally found in animal cells, which are able to nucleate microtubules, and sometimes give rise to centrioles and centrosomes. Plant cells lack centrioles and do not form typical centrosomes, but they have γ-tubulin rings throught the cytoplasm or associated to the nuclear envelope, so that they mainly nucleate microtubules in the cytoplasm periphery and on the nuclear envelope. In plant cells, the mitotic spindle is made up of microtubles nucleated on the chromosomes. In any case, γ-tubulin rings are needed. In yeasts, the main MTOC is known as polar body, which is inserted in the nuclear envelope (the mitotic spindle is intranuclear). Organization and movement of organelles. Microtubules are classified in two types: stable microtubules, located in cilia and flagella, and dynamic microtubules, located in the cytosol. Cytosolic microtubules, besides their role in the mitotic spindle formation and chromosome segregation, are also involved in the internal movement of organelles such as mitochondria, lysosomes, pigment inclusions, lipid drops, etcetera. They are also needed for vesicular trafficking. When cells in culture are observed at light microscopy, organelles show an alternation between quick movement and quiet periods. This behavior, known as saltatory movement, occurs when organelles are moving along the microtubules. Microtubules are rather passive structures since they do not interact directly with organelles. The movement of organelles along the microtubules is produced by the activity of proteins known as motor proteins. There are two families of motor proteins: kinesins and dyneins. Both can "walk" along the external surface of microtubule walls. Kinesins go toward the plus end, whereas dyneins go toward the minus end. Their molecular structure has two globular domains and a tail domain. The globular domains bind ATP, generate the movement, and interact directly with the microtubule, whereas the tail selects and binds the cargoes (mainly organelles). ATP hydrolysis in the globular part leads to tridimensional molecular changes that allow the movement of the protein along the microtubule, dragging the cargo. Besides moving cargoes through the cytoplasm, motor proteins are also involved in the shape and localization of some organelles such as the Golgi complex and endoplasmic reticulum. Addition of colchicine depolymerizes the microtubular system of the cell, and both organelles collapse and divide in small vesicles scattered through the cytoplasm. When colchicine is removed and microtubule repolymerization occurs, both organelles get again the typical shape and cellular localization. These experiments indicate that there are proteins in the membranes of these organelles that are recognized by motor proteins. Cilia and flagella are cellular structures protruding from the cell surface, contain microtubules, and are delimited by plasma membrane. Cells use cilia and flagella to move the surrounding liquid. They are also sensory structures. Cilia are shorter than flagella, are more numerous, and their movements propel the liquid parallel to the cell surface. Flagella move the surrounding liquid perpendicular to the cell surface. Cilia and flagella are complex structures made up of more than 250 different proteins. Both have a central structure of microtubules known as axoneme, surrounded by the plasma membrane. Axoneme is formed by 9 outer pairs of microtubules, plus a central pair of microtubules. This organization is written down as 9x2+2. Microtubules of the axoneme grow from the microtubules of the basal body. Basal body have 9 triplets of microtubules (i.e. 9x3+0). The axoneme organization is strengthened by a scaffold of proteins. The outer pairs of microtubules of the axoneme are connected between each other by nexin proteins, whereas protein spokes connect the outer pairs with the central pair. The motor protein dynein is located between the outer pairs. Dynein is involved in the movement of cilia and flagella. The movement is a consequence of the sliding of one outer pair over another adjacent one, which forces the bending of the axoneme. Some type of cilia are known as primary cilia. Primary cilia cannot move, are scarce, and sometimes appear alone in the cells. At least one cilium is present in most of the animal cells studied so far. Primary cilia bear in their membranes many receptors and ionic channels, so that a sensory role has been suggested. Nowadays, both primary and moving cilia are thought to develop a sensory function since both of them have receptors in their membranes.